Ishant Sharma will receive the Bharat Ratna for the year 2014 for his amazing bowling performance of 4 for 40 in his ten overs in the third and final one day match against South Africa that took place on 11/12/13. This decision came as a surprise to many as he edged out Sachin Tendulkar from the race. Sachin was supposed to get the Bharat Ratna for the year 2014. But Ishant ruined Sachin's chances with a brilliant performance with the ball. Ishant Sharma shocked the Nation by taking two wickets in one over.It was a great shock for the Nation and it came on the same day when Supreme court said that Homosexuals will get a life term. As a tribute to Ishant Sharma's heroics with the ball, rain intervened play and stopped the Indian batsmen from getting yet another thumping from the South African bowlers. It is raining in Ishant's forest. Doctors who were near the bedside of Nelson Mandela revealed that the last words of Nelson Mandela was "Ishant". He was also scared of this day it seems. Apparently Nelson Mandela was also a Bharat Ratna awardee. He was the second Non Indian to win the Bharat Ratna; the first being Mother Teresa (This is Chronicwriter's dose for General Knowledge for his readers). Critics say that it was not Ishant Sharma who bowled for India. Some of them even went on the extent of saying that it was Dale Steyn who wore an Ishant mask. We all know that stones will be thrown only on a tree with ripe fruits. So all the critics can go and hang themselves for creating a rumor like this. Talking to reporters from Cochin, the banned Indian bowler Sreesanth congratulated Ishant's effort. He even added that Ishant Sharma wore a towel inside his pants when he got those two wickets in the same over. He went on to say that he needed to see more aggression from Ishant. Mean while Poonam Pandey has announced that she will strip and run on the same day Ishant receives the Bharat Ratna. Politician Vijayaganth who is in Delhi to capture power in the National Capital called this performance "a bandasdik berfarmanze". 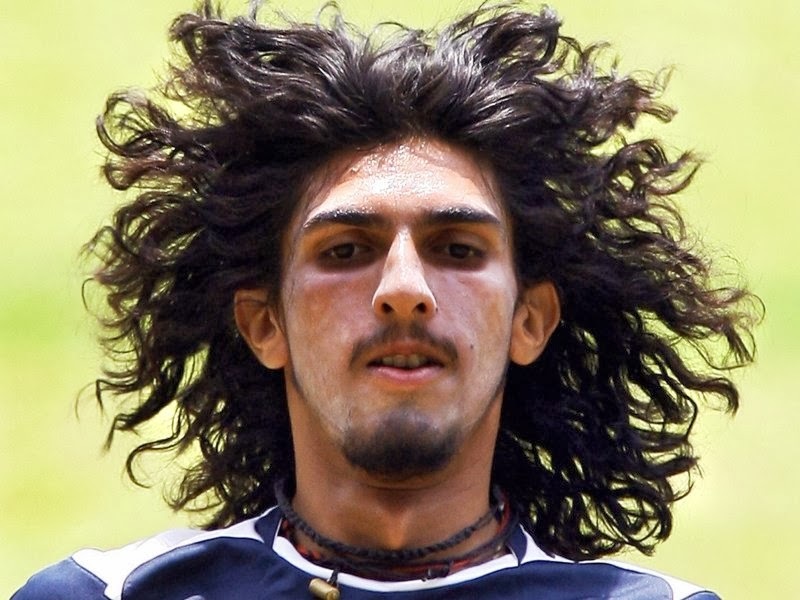 To honor Ishant Sharma's wonderful bowling figures, he launched his son as a hero in an upcoming film. Historians say that this launch has something to do with the Mayan Calendar that failed to keep up to its predictions of the doomsday prophesy with which it terrorized the world. Statisticians have come to the conclusion that the Mayans might have been approximately right and may be the end of the world has begun on 11.12.13. The RBI has made a public announcement that Ishant Sharma's face will be used in the Rs 1000 currency note. Speaking to news personnel, the RBI Governor confirmed this decision this evening. How ever he also said that Ishant Sharma's face will feature in the currency note only if he gets a hair cut. Note : This is Chronicwriter's 600th post. Chronicwriter has been blogging for ten years. This blog is in its 7 th year of Blogging journey and it has seen 10 million page hits over the years. The journey will continue unless and until Chronicwriter gets arrested for his satire posts. I was about to tell you to write something on the current south africa tour, but you had already wrote it. As saying says "Genius minds thinks alike". PS: this saying belongs to me, Patent rights #000420.